The Montblanc Summit is an Android Wear smartwatch that joins Tag Heuer, and more recently Louis Vuitton, in a bid to show Apple, Samsung, LG and the rest of the tech fraternity how to make a desirable connected timepiece. For a brand that's associated with luxury, that unsurprisingly comes at a price. The Summit will set you back anywhere from $890 to $1,070. You can even head into the thousands to have your own personalised dial made by one of Montblanc's creative directors. Whether you spend big or really big, you'll get yourself a smartwatch built from high grade materials, some Montblanc-themed digital watch faces, a heart rate monitor and Android Wear 2.0 straight out of the mountain-themed box. So is this Wear watch worth the big bucks or could you get more from your money for a lot less? 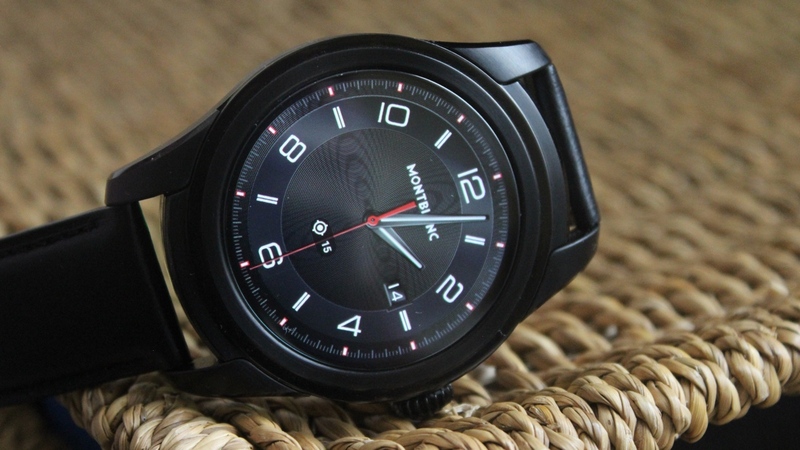 We've been living with the Montblanc Summit smartwatch to find out. Here's our full verdict. There are certain expectations you have when you know you're about to get your hands on something made by Montblanc. You expect something that's going to be beautifully constructed, that's going to feel like a luxury item and that's going to look the part. Unfortunately, you can't say all of those things about the Summit. It's just looks very, well, ordinary. Compare it to an Android Wear smartwatch like the LG Watch Style or something like the Tag Heuer Connected Modular 45 and the Summit just lacks that wow factor. The 46mm circular watch supposedly takes design inspiration from Montblanc's 1858 Summit watch collection, and while that might be true in as far as some of the same materials are used, that alluring design is MIA. You can't knock the stainless steel build and the finishing touches on the crown (that's not actually a crown), but it just feels like a missed opportunity to make a beautiful smartwatch that really stands out. The 1858 Summit inspiration extends to the calfskin leather black strap, which can be swapped out for a range of different bands if you prefer something bolder or more durable. There is also a more expensive titanium model, which we've seen up close as well, and will no doubt draw a few more admiring glances. At 12.5mm thick, the Summit is by no means the sveltest of the Android Wear smartwatches either, although it is slimmer than Tag's latest. And if you want a smartwatch to go swimming with, you're out of luck here. It's been slapped with an IP68 water resistant certification, matching the majority of Wear watches in being able to handle a bit of sweat and rain. Just don't take it anywhere near the sea or a swimming pool. One saving grace for the Summit is the screen. It's the first smartwatch to feature a curved sapphire crystal glass face and it screams quality. It's a full touchscreen with no flat tyre, but look a bit closer and there is a very thin black bezel going all the way around the edges. With the majority of watch faces available though, you are barely going to notice it. It's a 1.39-inch, 400 x 400 AMOLED display, so it delivers those deep, rich blacks and handles colour accuracy well too. It's a bright screen even when not cranked up to the max and it offers strong screen visibility in bright sunlight. As far as being top of the smartwatch display pile is concerned, it falls short of the quality delivered by the LG Watch Sport and its 1.38-inch, 480 x 480 resolution P-OLED screen. But it's no biggie, this is still a great smartwatch screen with very little to complain about. So let's get into it. This is a smartwatch running the latest version of Google's OS, and while the experience should be very consistent with other Wear watches, we're more interested in how Montblanc Summit puts its own unique spin on things. From a performance point of view, Wear 2.0 runs pretty slickly on the Summit. The Snapdragon Wear 2100 chip, along with the 512MB of RAM, makes sure there's no labouring app launches and you can swipe satisfyingly through the UI with plenty of zip. We also used it paired to an iPhone 6 and a Google Pixel and didn't experience any pairing issues, with Wear 2.0 running as it should with no problems. Speaking of Wear 2.0, you'll be able to do things like access the Play Store from the watch, launch Google Assistant, make use of the more advanced Google Fit features, swipe up from the watch screen to see your stream of notifications, and customise those watch faces. In terms of watch faces, Montblanc has created a bunch of its own that are a mix of chronograph, automatic and analogue-style. There are only a few on board to pick from though, with promises that more will be added in the future. The ones that are included do look pretty good, and we're particularly keen on the Urban and Sports Watch faces, the latter of which pulls through Google Fit data to the home screen. On the app front, there's not a great deal to shout about. Press that crown on the side and the only notable addition is a World Timer app, which lets you swipe through a map to view different time zones and add a complication to the watch face screen. Runtastic is also pre-installed as Montblanc is offering a three-month subscription to the premium version of the service. There is one notable Android Wear 2.0 omission here and it's a big one. The lack of NFC means there's no support for Android Pay. Of all the hardware extras, this felt like one that made sense for the Summit. We're also a bit disappointed that the crown doesn't twist like the ones on the LG Watch Sport and Style Wear watches, more because of the fact that it looks like it should be able to. As far as hardware extras go, Montblanc has made the decision to include a heart rate sensor. You can take on-the-spot readings via Google Fit and it works with third-party apps like Runtastic. It's just an odd inclusion when you consider that there's no built-in GPS to complement it. We'd have preferred GPS over a heart rate monitor if we had the choice. Actually, we'd have had NFC instead of both of those, and that would have made a lot more sense. As far as accuracy is concerned, it's what we've come to expect from the large majority of optical heart-rate sensors that we've put to the test. Using it with Google Fit for some run tracking, you're unable to view heart rate data in real-time, but it will pull out max and average BPM readings post-workout. Compared to a chest strap and TomTom's super reliable wrist HR monitor on the Spark 3 and Adventurer watches, it was often 4-5 BPM measurements out for max readings even without putting it to the high intensity test. That's enough to put you into another heart rate zone, which is not ideal if you're relying on the Summit for some HIIT training. With no GPS, you're relying on your phone or the motion sensors on board to track your workouts. For indoor treadmill running, it tended to overestimate running distance in comparison to our Garmin Forerunner 935 watch and the treadmill data. It feels like Montblanc has tried to cover all bases, but ultimately it's left a bit lacking in the fitness department. Don't expect any marvels in the battery department. The Summit is packing a 300mAh capacity battery which should get you through a day's use. On average we found that it entered battery saver territory at about midnight, so we'd be inclined to agree with that estimation. Obviously, this battery performance is based on what features you're making use of on a daily basis and whether you have that screen brightness cranked up to the max. There is an ambient light sensor to improve stamina, but if you're planning on using the heart rate monitor to work out or maintain a steady steam of notifications, it's going to be less than a day. When it comes to charging, you're relying on a small circular charging dock that clips into the charging pins on the back of the watch. It is at least a pretty quick charger, getting back to 100% from zero in about an hour and half. It’s hard to work out who the Montblanc Summit is going to appeal to. We think Montblanc watch fans will feel let down by the lacklustre design, while Android Wear fans will know they can get more features for significantly less money. If you’re really sold on a luxury Android Wear smartwatch, we’d say Tag Heuer has got more to offer in both of these departments. Yes, the Tag is more expensive, but if you’re already willing to spend big on an Android Wear smartwatch, it might be worth shelling out that bit extra for one that’s nicer in a lot of ways.